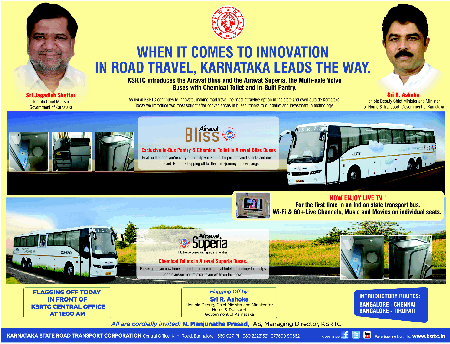 The government on Wednesday launched two new buses Airavat Bliss and Airavat Superia on introductory routes Bangalore to Chennai and Tirupati. while the first series comes with Chemical toilets and built in pantry, the second one comes with these and additionally live TV and wifi internet services throughout the journey. This definitely has perked up the road travel aspect for those who discerned it earlier due to the toilet break reasons! Additionally ladies can feel a bit more easier on these routes now. While a break of additional 15 minutes can be avoided, these buses would now be equally costiler and as much as comparable to other similar services such as Olivea which already operate in Bangalore. Definitely the KSRTC service would be a bit more practical while the Olivea is generally more comfortable due to superior seating even though its the same multi axle volvos. The real issue is the cleanliness of the toilets and overall sustained maintenance which would be an issue as the service is continued over a longer period of time. There is a general lack of concentration on this and its reflected by customer complaints already with Olivea. Lets hope KSRTC does not repeat the same mistakes. The costing of Olivea is about 2500 to 3000 bucks a one way ticket. However KSRTC does not still provide pricing details for this clearly on their website. Have you availed of their services already? Why not provide your opinion on the same in the comments section?